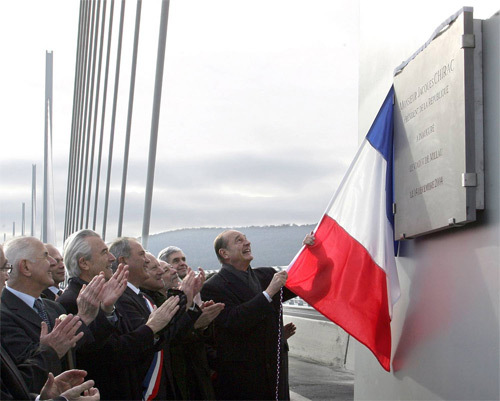 French President Jacques Chirac, right, unveils a plaque as he inaugurates the Millau brige, southern France, Tuesday Dec.14, 2004. When it opens to vehicles on Thursday, it will enable motorists to take a drive through the sky , 270 meters (891 feet) above the Tarn River valley for a 2.5 kilometer (1.6 mile) stretch through France's Massif Central mountains. From the left are: Jean Puech, senator of the region, Gilles de Robien, transports minister, Jacques Godfrain, mayor of Millau and British architect Lord Foster.